Guilderland is a town in Albany County, New York, United States. In the 2010 census, the town had a population of 35,303. The town is named for the Gelderland province in the Netherlands. The town of Guilderland is on the central-northwest border of the county. It is just west of Albany, the capital of the U.S. state of New York. During the US Revolutionary War many families in Guilderland were split in their loyalties. In New York, tenant farmers generally opposed their landlords, the Patroons, who sided with the rebellious independentists (Patriots), making New York one of the colonies where the war of Independence became a vicious civil war. The patroon of Rensselearswyck and the local clergy however were able to rally the support of the majority of the local settlers in opposing the Loyalists. Those remaining loyal to the established government operated among else from the caves of the Helderbergs raiding settlements with the help of Native American. A battle between Loyalists and rebel Schenectady Militia with help from Rhode Island Continental Troops was fought just east of Guilderland Center. It was later alleged that the local Loyalists were about to burn Schenectady and Albany, which is not entirely trustworthy as these would have been their own neighbors. In any case, the victory of the American forces allowed the Rhode Island contingent to travel to Saratoga for the Battle of Saratoga that occurred five weeks later, the turning point of the US Revolution. At the start of the Town's founding, the Schoolcraft family was prominent. Congressman John L. Schoolcraft was born in Guilderland in September 1806. When his father, Captain John Schoolcraft, died in December of the same year, he was raised by his grandfather, John Schoolcraft. Wealthy grandfather Schoolcraft, owned much property in Guilderland hamlet, ran an inn and tavern, was the first Justice of the Peace in the hamlet, an elder and trustee of the Hamilton Union Church, and a member of the first Guilderland School Board. He was also the uncle of the famed Henry Rowe Schoolcraft. John L. Schoolcraft started a profitable mercantile business, became president of Albany Commercial Bank (later to become a component of today's Key Bank), and was groomed for politics by Thurlow Weed, editor of the Albany Evening Journal, winning his first Congressional election in 1848. In the 1840s, Schoolcraft built the early Gothic Schoolcraft mansion John Schoolcraft House upon his return from a European journey. He used it mostly as a summer residence. Schoolcraft was a close friend and confidant of Governor William Seward and married Seward’s niece, Carolyn Canfield, in 1853. Beyond the U.S. National Register sites, Guilderland was also home to the New York Power Pool and its control center after the Power Pool's formation in 1966 in response to the 1965 blackout. Most of its operations were transferred over to the NYISO after the NYISO's formation in 1999. The NYISO built a new control center in 2014 in Rensselaer, New York. According to the United States Census Bureau, the town has a total area of 58.7 square miles (152 km2), of which, 57.9 square miles (150 km2) of it is land and 0.8 square miles (2.1 km2) of it (1.31%) is water. 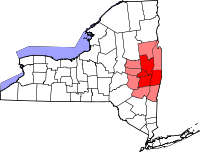 The town borders Schenectady County, New York, including the towns of Princetown and Rotterdam on the northern and western edges. 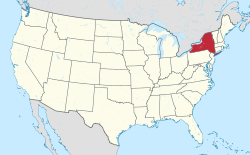 It also borders the towns of Berne, Colonie, Bethlehem, and New Scotland and the city of Albany. There are several ZIP codes in Guilderland, including 12084 (Guilderland), 12085 (Guilderland Center), 12203 (Albany), 12009 (Altamont), 12303 and 12306 (Schenectady), 12159 (Slingerlands), and 12186 (Voorheesville). Two interstate highways, I-87 and I-90 run through Guilderland, meeting in the city of Albany, north of Crossgates Mall a large mall on the edge of Guilderland. US 20 also runs through the town. As of the 2010 census, there were 35,303 people and 14,205 households residing in the town. The racial makeup of the town was 86.21% White, 3.41% African American, 0.14% Native American, 7.49% Asian, 0.04% Pacific Islander, 0.01% American Indian and Alaska Native, 0.93% from other races, and 1.76% from two or more races. Hispanic or Latino of any race were 3.2% of the population. In the town, the population was spread out with 24.1% under the age of 18, 6.0% from 18 to 24, 30.9% from 25 to 44, 25.9% from 45 to 64, and 13.2% who were 65 years of age or older. The median age was 39 years. For every 100 females, there were 92.4 males. For every 100 females age 18 and over, there were 89.4 males. Guilderland is served by the Guilderland Central School District. It has one high school, Guilderland High School, one middle school, Farnsworth Middle School, and five elementary schools. These include Guilderland Elementary School, Pine Bush Elementary School, Lynnwood Elementary School, Altamont Elementary School, and Westmere Elementary School. Some portions of the town are served by other school districts, including Voorheesville Central School District, based in the town of New Scotland; as well as Schalmont Central School District and Mohonasen Central School District, both of which are based in the town of Rotterdam. The current town supervisor is Peter G. Barber (since 2016). The current councilmen and councilwomen are Patricia Slavick (2000), Paul Pastore (2006), Lee Carman (2016), and Rosemary Centi (2016). Jean J. Cataldo is the current town clerk. Lynne Buchanan is the current Receiver of Taxes. The current town attorney is James Melita. The seat of Guilderland's government is the Guilderland Town Hall. The Town of Guilderland website is www.townofguilderland.org. Like most of Albany County, Guilderland generally votes for Democrats for state and federal offices. Barack Obama received 60 percent of the vote in Guilderland in 2008, and 59 percent in 2012. Senators Schumer and Gillibrand and Representative Tonko all easily won Guilderland in their most recent elections. In June 2018, Richard Sherwood, a former town judge, pleaded guilty to federal money laundering and tax evasion charges as well as a state grand larceny charge. Sherwood stole $11 million from estate trust funds he was charged with managing in his private practice. He also transferred property to his own name. He faces 3.5 years to 10 years in prison. Emergency Medical Services for the town of Guilderland are provided by four separate medical entities. Guilderland EMS, which is a division of the Guilderland Police Department, provides the Advanced Life Support (career paramedics) for the town as well as other surrounding areas. Western Turnpike Rescue Squad, serving the local community since 1939 and Altamont Rescue Squad, established in 1937 both provide Basic Life Support care as well as medical transport for the town in their designated zones. During college semesters BLS care and transport for the University of Albany is provided by Five Quad, an all volunteer EMS agency consisting of University of Albany students and alumni. There are eight main fire departments that also provide rescue; including Guilderland Fire Department, Westmere Fire Department Guilderland Center Fire Department, Fort Hunter Fire Department, Altamont Fire Department, North Bethlehem Fire Department, McKownville Fire Department and Pine Grove Fire Department. The Guilderland Police Department is staffed by 36 sworn members along with 10 telecommunicators, 3 administrative office staff members, 3 animal services members and 20 full time and part time, paramedics operating under the EMS division. The police department is organized into the Patrol Division, Criminal Investigations Unit, Traffic Safety Unit, Community Services Unit, K-9 Unit, Communications Division, and Animal Control Unit. The Guilderland Police Department is headquartered in Guilderland Town Hall with a sub-station located at Crossgates Mall. Westmere – A hamlet in the eastern part of the town on Route 20 and a suburb of Albany; a census-designated place (CDP) of the same name is designated over this area. There are actually two libraries located in the Town of Guilderland: The Guilderland Public Library, and the Altamont Free Library. Both are members of the Upper Hudson Library System. The Guilderland Public Library, located at 2228 Western Avenue (US Route 20) serves as a cultural center for the town and the surrounding area. Some 59% of town residents hold library cards. Library use has grown with the population of the town. Since 1992, when the Guilderland Public Library moved into its current location, patron visits have almost doubled, from 177,996 to 343,144 annually, and circulation has more than doubled, from 214,446 to 519,426 items every year. The Altamont Free Library, located in and serving the Village of Altamont, is a free association library. The Village of Altmont is a political entity within the borders of the Town of Guilderland. David Paterson, while his primary residence is located downstate in Harlem, the former Governor of New York maintained a residence in Guilderland as a state senator and later Lieutenant Governor of New York prior to assuming the governorship. Paterson resided in the New York State Executive Mansion while in Albany, but kept his Guilderland and Harlem residences. The Chen family, a Chinese immigrant family of four killed in their Westmere house in 2014; the case remains open. ^ a b George Howell and Jonathan Tenney (1886). Bi-Centennial History of Albany: History of the County of Albany from 1609-1886; Volume 1. W.W. Munsell and Company. p. 77. Retrieved 2010-02-24. ^ a b c d e Arthur B. Gregg (1966). "Outline History of the Town of Guilderland, Albany County, New York". Retrieved 2010-02-21. ^ Laws of the State of New York, Passed at the Ninety-Third Session of the Legislature, Begun January Fourth, and Ended April Twenty-Sixth, 1870, in the City of Albany. Volume I. State of New York/ Weed, Parsons and Company. 1870. Retrieved 2010-02-24. ^ Laws of the State of New York, Passed at the Ninety-Fourth Session of the Legislature, Begun January Third, and Ended April Twenty-first 1871, in the City of Albany. Volume II. State of New York/ The Argus Company. 1871. p. 1688. Retrieved 2010-02-24. ^ "Appendix". Albany County, New York. Archived from the original on 2008-08-23. Retrieved 2010-02-24. ^ "NYISO Control Center Project Announcement" (PDF). Retrieved November 15, 2018. ^ VICTOR K. MCELHENY (November 7, 1975). "Another Big Blackout? Not if They Can Help It". New York Times. Retrieved November 15, 2018. ^ Eric Anderson (November 12, 2015). "50 years ago Albany went dark in the Great Northeast Blackout". Times Union. Retrieved November 15, 2018. ^ LARRY RULISON (December 2, 2009). "NYISO marks 10 years in power". Times Union. Retrieved November 15, 2018. ^ Stephen Whitley (August 27, 2014). "NYISO Opens New Power Control Center". Retrieved November 15, 2018. ^ Andrew Denney (June 11, 2018). "Former Albany-Area Judge Pleads Guilty to Scamming Millions From Estate". New York Law Journal. ^ "A.G. Underwood Announces Guilty Plea Of Former Guilderland Town Judge Richard Sherwood For Stealing Over $11 Million In Family Trusts He Oversaw". NYS AG. Retrieved November 15, 2018. ^ Robert Gavin (September 13, 2018). "Ex-Guilderland judge Sherwood disbarred". Times Union. Retrieved November 15, 2018. ^ "Western Turnpike Rescue Squad". ^ "Home". Guilderland Fire Department. Retrieved 6 April 2018. ^ Department, Westmere Fire. "Westmere Fire Department - Albany County, NY". www.westmerefd.org. Retrieved 6 April 2018. ^ "timesunion.com : communities: guilderland center fire department". timesunion.com. Retrieved 6 April 2018. ^ "Altamont Fire Department". altamontfd.dyndns.org. Retrieved 6 April 2018. ^ "Home". uhls.org. Retrieved 6 April 2018. ^ "Home". Guilderland Public Library. Retrieved 6 April 2018. ^ "Altamont Free Library - Serving the Community since 1916". www.altamontfreelibrary.org. Retrieved 6 April 2018. ^ Grondhal, Paul (2008-03-12). "In the wings, a friendly neighbor". Albany Times Union. Archived from the original on July 26, 2009. Retrieved 2008-04-26. ^ Confessore, Nicholas (2008-03-26). "Paterson Family Is Moving Into the Executive Mansion". The New York Times. Retrieved 2008-04-26. ^ Grondahl, Paul (October 12, 2014). "Human trafficking, undocumented workers part of Guilderland homicide investigation". Albany Times-Union. Retrieved September 30, 2018. Wikimedia Commons has media related to Guilderland, New York. This page was last edited on 18 February 2019, at 12:52 (UTC).